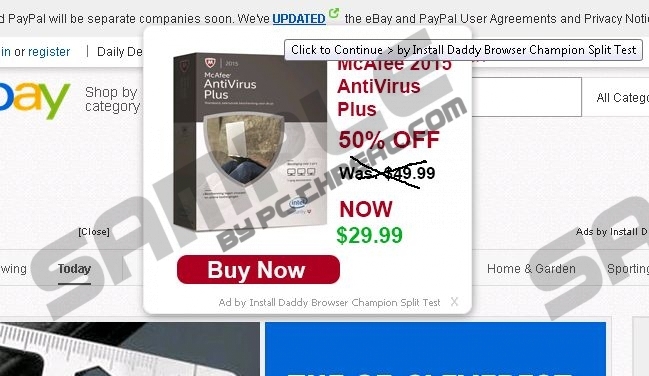 Daddy Browser Champion yet another adware program that must be removed without any hesitation as it is a worthless piece of software. Often vendors of adware programs employ misleading marketing strategies to lure unsuspecting users into downloading and installing such invasive applications. Daddy Browser Champion could also use hoax advertising promising you to improve your web-surfing experience in some way. Unfortunately, this adware will only cause endless annoyance and frustration as long as it is active on your operating system. What is even worse is that it has been discovered that in some cases this intrusive adware program could act in an entirely malicious way meaning that it might impose major virtual threats. Do not hesitate to use the removal guide that we provide below to remove Daddy Browser Champion in a quick and easy manner. As soon as this invasive adware program enters your operating system it will almost instantly affect your web browser. It has to be noted that major browsers such as Mozilla Firefox, Internet Explorer, and Google Chrome are affected by Daddy Browser Champion. This means that virtually no user is actually safe from this adware program. Numerous third-party ads and unwanted pop-ups are the primary indications that Daddy Browser Champion is active on your PC. Instead of improving it in any kind of way this invasive activity will without a doubt make browsing the web a frustrating experience. Fighting through tons of ads and unwanted pop-ups will be a daily ritual as long as Daddy Browser Champion is active on your PC. A through the removal of this Daddy Browser Champion is the only sure way to stop the annoying activity that his adware promotes. While annoyance and frustration caused by Daddy Browser Champion is the most prominent feature of it, unfortunately, there is something much worse about this adware. During the research, it has been discovered that some ads provided by Daddy Browser Champion could be implemented with redirect links. This is very alarming because just by clicking on a simple ad that this adware provides you could be taken to suspicious third-party websites. For example, you could land on a fake online store crafted by cyber crooks for one reason only – to steal your credit card data. If you encounter a dubious looking online shop after clicking on an ad make sure to learn about it as much as possible before making any purchase. Otherwise, you could face devastating outcomes. It should be more than obvious that the removal of Daddy Browser Champion must be carried out without any hesitation as it is your best bet to maintain a system that is safe and secure at all times. The removal of Daddy Browser Champion is crucial and should not be delayed. In order to be sure that every single bit of Daddy Browser Champion has been removed we advise you to conduct an in-depth analysis of your PC for potential leftovers associated with this adware. If any files or registry entries related to this adware are, they must be deleted as soon as possible. If you think that manual analysis of your PC is too complicated, scan your PC with a reliable antimalware tool as it would automatically detect potentially malicious files linked to Daddy Browser Champion. Select Daddy Browser Champion and then select Uninstall. Move the mouse cursor to the lower-left corner of the desktop. Right-click Daddy Browser Champion and select Uninstall. Quick & tested solution for Daddy Browser Champion removal.